this may seem a bit of a keyboard warrior like post or totally random, and I did a quick search to see if there was a general Jurassic World thread to add my thoughts to (lost of fringe threads, but no main one). So as a big Lego fan what better way to enjoy the film than buy the Lego, admittedly I didn't think much of the sets when they were first shown, but having not seen the film it was hard to really judge them, having now seen the film I am struggling to think of a wave that manages to totally fail in capturing the feel, heart and almost anything of a film as much as this wave. That isn't to say there are nice items in the wave, I think everyone will agree the Mini-figs and Dinos are great, and yes they are a big selling point, maybe the main selling point, but the sets, the buildings and vehicles have to match, certainly at the highest RRP's being set, and without giving away spoilers, they don't, not even close. First off the jeep, while it is a great looking jeep, it doesn't appear in the film, at least not in the blue and for those that have seen the film a big trick has been missed there. The Gyropods look nice but are way out of proportion, they are all two seaters. The helicopters, frankly I have no idea where to start there. And the buildings, the Rex pen isn't too bad but not really accurate and as for the Raptor pen, not even close. In fact the most accurate set is the vet truck, and frankly it is a bit rubbish. warching the film there were so many other options it makes me wander how they came up with these sets, but also why no throwback sets to older films, which do appear in the game so clearly there are no issues with the rights, maybe these will come later, hopefully they will. I agree that the sets aren't great, but it's clearly all about the dinosaurs and the minifigs. I'm much more out off by the price points. Even considering these are licensed, I still think most are at least $10-20 over priced for the part counts. I would love to have the Indominus Rex, some raptors and the main cast, but not until I can get a good deal. Considering the movie generated a bazillion dollars last weekend, I don't see any reason that the sets won't do well despite their less-than-spectacular accuracy. They were likely working off concept art or early-stage art direction. They also had to hit certain price points and have a consistent color palette. The dinosaurs clearly took top priority and sets were designed around including them. Love the color scheme for the dinosaur and the blue is good but a few sets are very far from movie depictions. It is okay after all they do the job but just not great on the price. The only set I've gotten was the Jeep and I got it for deep discount. I only got this set because I made my money back on the dinosaur and the kid, I love the new gyro spheres even though they are too small and if you don't put the stickers on the Jeep, it turns out to be a pretty good generic blue and white Jeep. The monorail would have been great! I'm also a little disappointed they didn't make a mesosaurus. There should have been some representation of the actual theme park with some generic guests to get eaten, and not just vehicles and cages. Parents see LEGO JW in the store aisles. Parents think OH Wowee JW is a kiddie movie! Parents bring kids to see JW. + you know, nostalgia and all that. Addit: Megablocks scores yet another home run with their Minion sets. I slightly disagree about who these sets are aimed at, while lego is for kids of all ages, the film has a 12 rating, and for good reason, which means, that older children/young teenagers are the target age the Lego sets have to pitch at, as that is the youngest age recommended to see the film. With the target age of the film in mind sets are too expensive to buy for younger children just for Dinos (cool as they are) and just not acurate enough for anyone older, who style of play can be noticeably different. the monorail was a massive missed opertunity, add in no iconic gate, almost zero accuracy on the vehicles with several just invented for the sets and to be honest one pretty big omissions on the Dino front as well and we are back to a by the numbers price point driven, cookie cutter wave of sets that lack heart and soul and therefore aren't sure who they are aimed at. the film is a massive hit and more films will follow but somehow I just can't see the sets flying off the shelves, if anything they serve to show how good Legos own Dino line from a few years back was. They lack any reference to the older films so no nostalgic pull, they offer no iconic imagery and scene recreation so no wow factor and no movie accuracy so no recreation factor. i also refuse to by into the 'working of concept art' excuse, as far back as 2 years ago imagery and art was public ally available and there were clear references to the originals etc. they had enough time to get the Dino's right but not the sets? i may be reiterating my original post but we (the public) are expected to pay big bucks for movie themed sets then they need to reflect the movie, and we know Lego can get movie themed sets right, because they have a great track record, and I am sure they got the same time and design constraints for those films as this one. i hope this isn't the only wave to come out, I hope Lego can produce more JP sets, with great accuracy to all the films in the future, but it's an inauspicious start. I'm not so sure they do need to aim the sets at the people that watch the film at the cinema. My kids have enjoyed star wars ships and reading SW books, before seeing the film. They know about Batman and Robin, Spiderman, Superman, etc without ever seeing a film. Aiming sets at young teens is difficult. It is a time kids are leaving lego for other things. Would lego risk not selling to younger kids, in the hope of getting older kids (or their parents) to buy the lego? Parents will buy JW sets for younger kids. Kids love dinosaurs, without needing to see the slightly gory / threat side of them in the film. I'm actually a little disappointed in the Dinosaurs. I have only seen picture/box art, but to me they seem a bit same same. The flappy eared thing looks to be a raptor with flaps, so basically 3 Raptor sets. While the Albino Dino is a T-Rex with some bumps down its back. I would love to have seen at least one other dinosaurs maybe two, something along the lines of Stegosaurus, Brontosaurus or Triceratops. I will say that after watching the movie with my oldest kid and seeing the sets, I was disappointed by the sets. For a theme where the focus is on dinos, the largest set has only the one. When compared to the last wave of Dino sets, that seems a bit lame. I am also suprised that as main characters that Owen and Claire only appear in a single set. There are also sets that simoky do not match the movie. The gyroball was never launched from the pen. The raptor escape is also off. At the same time, I am not sure any of that matters. The sets are going to appeal to kids that like Dinosaurs, and it does not really matter that they have or have not seen the films. 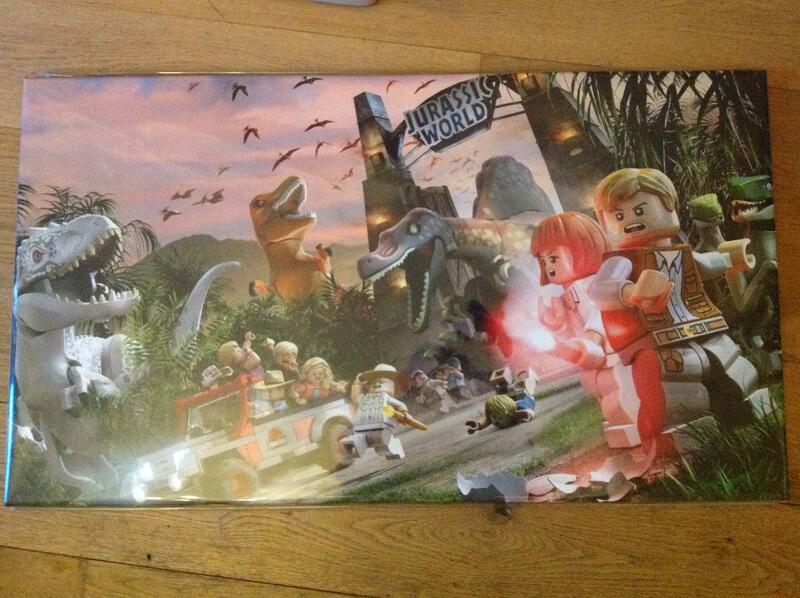 A younger kid is going to want a set because of a Dino, not because of the film. Basically, Lego created sets that focused mainly on vehicles with 1-2 dinos. The were smart to have two sets that have two raptors each. Because of this, I really do not think Lego has aimed these sets at teens, but towards younger kids, with the hope of also getting kids that have seen the film. Because of this, they took liberties with the facts of the film, to add olayability features, such as the gyroball in the large set. As as a note, I read that one of the reasons they had not predicted this movie to do as well as it did is because it did far better with families than expected to. Parents brought their kids due to a bit of nostalgia factor, despite the rating. This matched what my older kid and I saw... Younger kids in the audience as well. They look rather close to the 2012 dino sets to me, except the color scheme is different and the style looks more clinical than jungle adventurers. I do not find the sets to be great, but I don't think that they're quite as huge missed opportunity as some others. A monorail would be fantastic, but it would be very expensive and how would it relate to any of the dinosaur action? The helicopter and gyro sphere both tie in to the film, and the fact that the latter only seats one is consistent with typical minifigure capacity/scale. as someone mentioned, Claire and Owen should've been in more than one set, the kids should've appeared and an aquatic set would have been well-warranted. Also, the command/computer center or genetics lab. But the sets as-is, I don't think that they completely miss the point. The biggest problem is the pricing, but otherwise they include good dinosaurs and figures, and the builds can be customized. Also, I was in a store over the weekend, and there was a huge empty space on the shelves where these sets were marked. So they did fly off in that isolated case, at least. I haven't purchased any yet, but I find myself wishing they had done a "main street" from the Jurassic World set as lots of dino carnage took place there. As is - with vehicles and enclosures, it feels more zoo than theme park. These are already flying off the shelves. I see the sets selling out at my local Targets. I haven't seen the movie yet but from what I've seen in the trailers, I don't see any distinctive vehicles that they could have made interesting sets out of except for the gyroballs, which they actually did a good job with. Yeah it looks like they re-used quite a bit from their previous Dino line but it's to be expected. It's not like any of their other licensed themes are doing anything groundbreaking. My 6 year old wants all of these, as do all of his friends. For kids that age, it isn't about movie accuracy. Kids want dinos plus something the dinos can live in, get chased by, or destroy. Pretty simple. These toys are for kids under 10, not teens or adults. Could they have been more accurate to the movie? Sure. Is that what is needed to sell them to the target LEGO audience? Nope. I kind of want this. Not perfect but look like fun sets. I'm not too much into vehicles, but I can see the attraction. My biggest complaint is these seem slightly higher priced than sets of those piece counts. More dinosaurs would have been nice, but I'm hoping this is not a one and done line (which with the inclusion in Dimensions may be a hint of something more). "They will sell irrespective of what they look like because of the Dino's and mostly they will be bought by nostalgic adults for kids that are too young to see the film? Now, that might be a touch glib and generalist, but why did Lego fork out for a licence when they had their own Dino line at a lower price bracket already, if not to represent and promote a film. Yes they will profit of the back off the film but are we now saying it doesn't matter what the sets are like, if they are tied to a popular film with some good figs etc. that's all that matters? granted I am being slightly contrived in my thinking, but it all boils back to my first point. but to contradict myself, I hope they do sell as that increases the chances of more sets and better sets that if they do come could be very exciting. We don't know what they forked out, or even whether this is a specific license for Jurassic World, or other license tie-ins at the same time. For the LEGO group, I think being tied in to a popular film with good figs is probably no different to being tied to a popular film and being movie accurate. Both are better than being tied to an unpopular film with movie accurate sets. I'm not sure where they would be if they did an unlicensed Dino range to coincide with Jurassic World, when you consider that the license may have gone to a clone brand leaving lego looking like the knock-off non-licensed brand for Jurassic World to parents. I do think it's a shame they focussed purely on tying in to the current movie, rather than building sets including some of the past movies just as the game tied it all in together. T-Rex breakout from the first movie with the iconic Jurassic Park vehicle, a T-Rex, the toilet, and a fence would've made a great and iconic set, far surpassing the nonsense T-Rex transporter. The worst part is it's like they almost got there - the Dilophosaurus wasn't in the new film from what I remember other than as a hologram display. If they'd gone all the way and similarly done the Dilophosaurus ambush from the crashed Jeep on the first film it too would've made a better set. Considering that the video game covers all 4 films and that they made sets for all 4 Indiana Jones movies and not just Crystal Skull, I'd say it's possible that there will be a line of flashback sets in the future. I just can't imagine that Lego got such a classic license without any consideration for making classic sets. There have been several recent cases where LEGO has produced sets based on older films in a franchise in anticipation of a new film in that franchise: Indiana Jones, Pirates of the Caribbean, Toy Story, Cars, and Lord of the Rings. In each case, the sets based on the older films were released before sets based on the new film or at the same time. If there is a second wave of Jurassic World sets, I think there's a possibility of sets based on the previous films. But as much as I'd like to see that happen, I don't expect it will. The ideal time to release sets based on previous films is during the hype leading up to the new film. Just because they have the license for Jurassic World doesn't mean they have the license for the previous films. I suppose it could be slightly different this time as up until recently I believe someone else held the Jurassic Park rights for this sort of thing? Maybe they didn't do the classic sets in the run up because they only got the license relatively last minute? If so there may be reason things are being done the other way round this time, though I wont hold my breath. Advertisement is a huge thing and has a huge impact. Kids get bombarded by advertisement all the time. Every commercial, every Jurrasic Park tshirt, every store display, every magazine cover in the check-out aisle, every older brother or sister that sees the movie and tells their younger sibling about it... It is all FREE advertisement for Lego. It is also a prolific amount of advertisement. My speculation is that Lego will sell FAR more of this Dino series over the last one because of the sheer amount of advertisement happening. It probably more than easily makes up for the license cost. Lego basically just has to put out some cool dinosaurs, some of the main figures, vehicles, and special features in their larger sets, and the sets will sell. At the store I looked at, the only sets available were the two largest ones. The smallest ones were wiped. So, yes... I think to some degree there are aspects with the sets that do not matter if they hit those elements. Well, I am now a hypocrite, (well slightly more of one than normal). Having 'dissed' these sets I now own a few, admittedly they came as Father's Day gifts and have quickly been co-opted by my four year old. i haven't changed my opinion of them based on their accuracy to the movie (we have 75915 & 75920) but as playable models both my kids are excited by them and the youngest is simply mad about them, the Lego experience was enhanced by the fact we built these while watching the original film, so that made it a fun afternoon. i still say these are too expensive and too inacurate, but the kids love them, the figures and Dino's are great and I can now see other sets getting bought in my household as they seem to have caught their imaginations in a way the Dino line from a few years ago never did. That's probably from the video game though leetshoe? Yeah, the only nostalgia you'll get is from the video game (which is excellent btw). Having just seen the movie, I'm curious about the "big omission" you're referring to. It seems to me they covered all of the major players (I-rex, T-rex, raptors, and pteranodon). The Mosasaurus perhaps? Not really a spoiler since it is featured in the trailer. Indeed, the omission of an aquatic set is a shame as it is so unique to this film compaired to the other three. but the theme is young so you never know what is around the corner. I thought you might be referring to the mosasaur but didn't give it much thought because it's so large. It wouldn't translate to LEGO very well. A brick-built head is probably the best they could have done. Lego is never going to make that Mosasaurus set. Yeah, it goes back a bit to what I was saying earlier. I do not know that it matters... Dinos and vehicles.. If it appeals to kids interested in Dinos, they will sell and kids will have fun. This licensed line, from my point of view, confirm the rule that lego works better when taking inspiration from a generic theme than just copying a specific product. Sure, here we have a nice combination of colours, cool dinosaurs and minifigs, (few) captivating vehicles, but really nothing more than just the same winning marketing formula, this time driven to the extreme. The comparison with Dino line from a few years ago comes spontaneous, not only those sets were equally captivating (the magic word for marketing) to JW sets, but also more fanciful than the MOVIE itself from which they have taken the subject for this debated line. The same parallelism I could do between Fantasy Era and LOTR, or between Pirates and Pirates of the caribbean. It seems that copying a specific brand follows a very well defined process in which attention for unnecessary details (for examples, modulars, in opposite with licensed themes) is substituted with an accurate choice of few very rapresentative and iconic details, with the final result of giving a skeletal, but essential impression of completeness. This is, surely, a very interessant argument of conversation, but maybe far too much cmplicated for my english knowledge. I'm not sure I understand the parallelism between LoTR and Fantasy Era or Pirates and PotC. The licensed themes seemed to take a different direction, more realistic, less childlish. They feature ideas you don't see in the classic unlicensed lines such as a mill or a street chase in PotC, or the various ruined battlefields in LotR. The Jurassic World sets are crap. The fact that they are popular just goes to show how important an IP is to selling product. Unfortunately. One thing that I really hate about these sets is that they offer zero ambiance. No sense of locale. Where are the palm trees and other flora that can be fun to build in Lego form. Just straight up dinos, minifigs and abstract vehicles. Aimed at kids I know, but how any AFOL would be interested aside from the dinosaurs is beyond me. I think it's not a matter of childish or not. A mill or a street chase are not more realistic only cause they are scenes of a movie. Unlicensed themes have in general more generic features, but this doesn't mean less realistic, or childish. Yes, it seems that Lego has had several licensed themes that are analogous, but not strictly replacements, for other in house themes. You could also mention Western compared to Lone Ranger. How would you guys rank Space against Star Wars, for instance? I think these themes are further apart than Jurassic World and the previous Dinos. Star Wars is different than Space. There is usually an alternate space-theme. ^Oh, I understand that. What I meant was that Star Wars is probably the closest licensed theme to Space, as that was what was being compared before (licensed to in-house). Galaxy Squad and Alien Conquest are in-house and (according to Bricklink) fall under the umbrella of Space. star wars replaced space for several years I think, but the universes and designs are quite different, I don't think star wars has saucers or ships shaped like insects? ^ I completely agree with your point. It wouldn't surprise me if they retired (or didn't extend) the dino theme due to the Jurassic World licensing agreement. SW, however, is its own animal, and I would see circumstances where Lego would license another space-related property irrespective of the SW line.